Former staff member for the Florida House of Representatives, Florida Senate and Florida Department of Insurance. Named one of the "100 Most Influential People in Florida"
As a co-founding member of Capital City Consulting, Nick has worked on local, state, and federal government policy issues for over 20 years. Recently named by Influence Magazine as one of the 100 Most Influential People in Florida, Nick is considered the best in his field representing a diverse client base before Florida’s government including: financial services, insurance, environmental, gaming, retail, education, alcohol, information technology, tobacco, and procurement. Over the years, Nick lobbied to pass countless pieces of legislation on behalf of his clients and secured over a billion dollars in legislative appropriations. Nick is often relied on by clients to assist on various public affairs aspects such as crisis management, message development, and political branding. 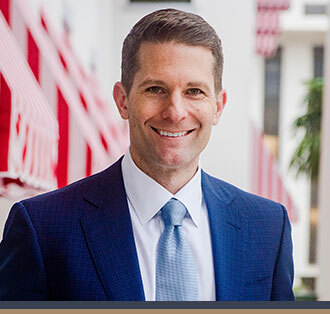 Before starting our firm, Nick practiced law and government affairs at a prominent Florida law firm after working in the Senate Majority Office and Office of Insurance Regulation as a law clerk. He is currently of counsel at the Radey Law firm in Tallahassee. Nick graduated from Florida State University with honors, where he served as student body president and also received his JD from Florida State University Law School.